Pros: A strong opinion piece with a definitive voice, unafraid of the provocative and outrageous – everything a good piece of political theatre should be. Cons: The strong, definitive ‘voice’ waxes didactic and prescriptive, wavering dangerously on the line of a monotonous rant. 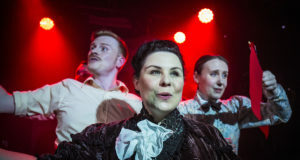 Our Verdict: The author makes a sharp point, but I felt I was being told what to think – off-putting for a free-thinking theatre-goer in a democratic society. Or is that his point? 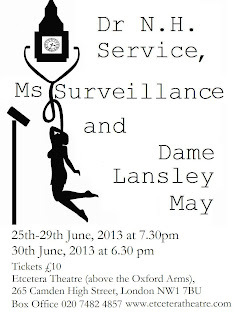 I suppose the hint was in the title; one should not go to a play entitled Dr N. H. Service, Ms Surveillance and Dame Lansley May and not expect it to have a very specific political bias, particularly given the current political climate. However there is a difference between presenting a point of view or a belief and unrelentingly ramming it down one’s throat. In a first meeting between Bavarian mercenary Dr N.H. Service, UK Secretary of State for Healthy Minds Dame Lansley May, and her personal assistant Ms Surveillance, we see a self-serving Secretary of State buy into a proposal – deemed as research by the good doctor – to use the Public Health Service as a means to identify political radicals and those against the government. The ultimate aim: ‘to close the gap between government ministers and the Judiciary by arming the government with arbitrary powers to target diffident bloggers and climate protesters.’ Seemingly turned on by this ultimate control and power, Dame Lansley May sees an alternate use for Dr. Service’s plan: to flush out a mole among her party who is leaking documents to a radical Liberal MP. While the Doctor and Secretary of State represent the ‘evil’ current government, the playwright’s self-righteous plea for personal freedoms and a democratic society are represented by the ‘common man’ PA, Ms. Surveillance. Now, obviously I have nothing against rights, freedoms and due process for all. It is what I know and believe to be right, and in chaotic times of conflict, terrorism and economic collapse it is important to affirm the need for a free and democratic society. However, Paul Martin’s script comes off as paranoid propaganda in the opposite direction, presenting a very well-read, authoritative and intellectual voice, arrogantly preaching that it knows a thing or two, and gosh darn it, you will too by the time we’re done here. 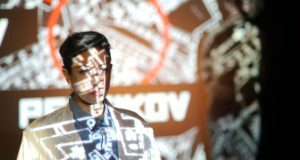 The characters for the most part become empty vessels of quotes and statistics set against each other to provide evidence of one massive conspiracy theory. Actors fumbled through their lines, most likely through no fault of their own, but rather because they stood as archetypes delivering memorized speeches rather than fully fleshed, relatable characters. 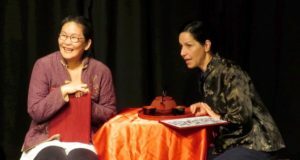 The exception to this would be Dr N.H. Service herself, played by the obviously talented Jennie Jacobs, who was able to bring depth, humour and nuance to her character despite its blatant intention as an instrument of political opinion and anxiety. Notwithstanding the preachy content, Martin, with his director hat on, constructed a tight and well-presented show. Although this piece certainly stimulated (half of my theatre ‘musts’) it dismissed the audiences’ right to question and debate the content and make up their own mind – certainly diminishing the enjoyment and entertainment (the other ‘musts’). While I appreciate a strong opinion, I do not like being told what to think. Martin’s piece would greatly benefit from the freedom of choice which Ms. Surveillance craves. 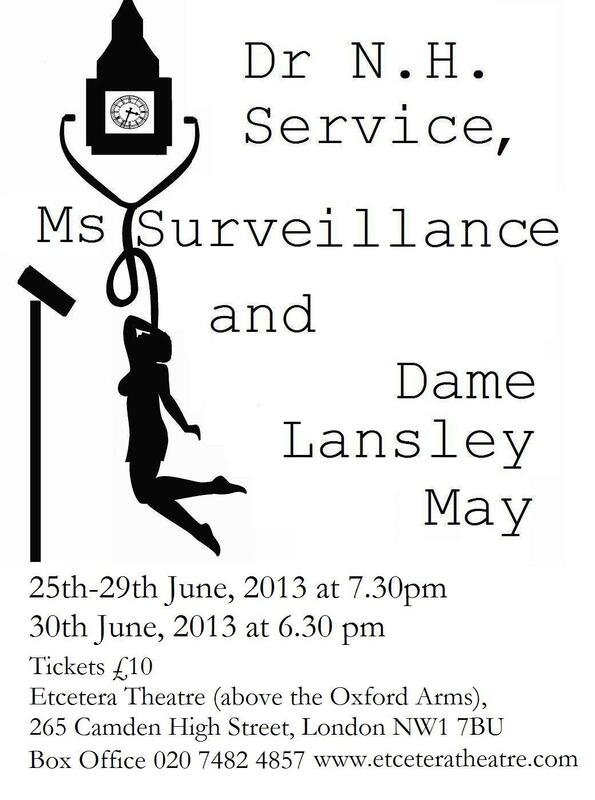 Dr N. H Service runs at Etcetera Theatre until 30 June 2013.